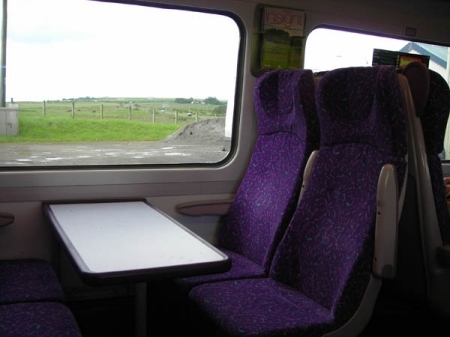 Members travelling by train to the AGM in Thurso were given the opportunity of sampling the first of the refurbished 158 to enter service. We were accompanied by two engineers from First ScotRail who were inspecting the train to see how the modifications were working. The only thing that was giving them concern was a leaking window which hadn't been part of the planned refurbishment! The 158s had been much criticised by passengers for their lack of leg room, uncomfortable seats, poor toilets and inadequate space for luggage and bicycles. 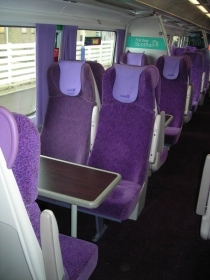 But they have been improved as part of a £20 million investment by First ScotRail and Transport Scotland, which contributed £9m towards the cost of the project. The seats are much more comfortable, but have higher backs so the view down the carriage is even more restricted. Legroom is better and the excellent alignment with the windows improves the sideways view. The handle to pull down the seat back table on the airline seats is good - provided they last and don't get ripped off. There are new carpets and you can feel the pile in the carpet. 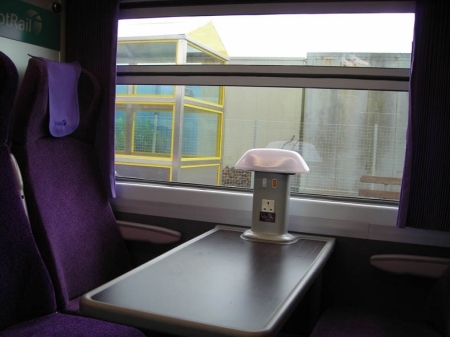 The 1st class area does not have a door, so there is no privacy from the noise in the rest of the coach and it will be difficult to justify a 1st class fare although a laptop supplement might be possible. 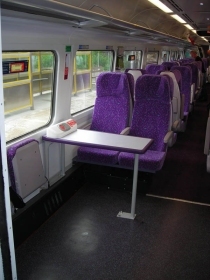 Laptop sockets, lamps, antimacassars and curtains are provided for the six priority seats which have good leg room. 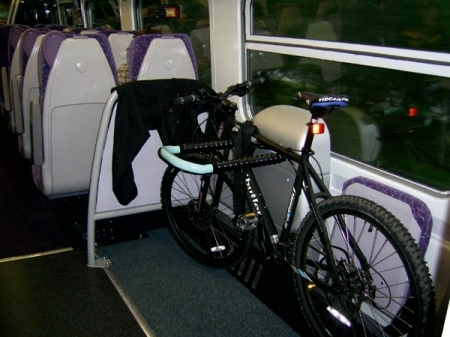 Disabled passenger provision is better, with a very roomy area at the end of coach A, which is also fitted out with straps for 2 bikes, (giving a total of 4 bikes), or the alternative of 2 tip-up seats. A folded up wheelchair fits under the luggage rack shelf in coach B, so provision for disabled passengers is quite good. 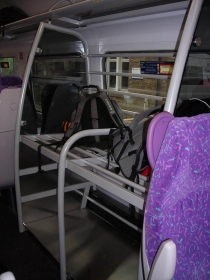 Luggage space is increased and there are racks in the middle of the coaches as well as at the ends. The transparent bottomed luggage racks above the seats are better and the lighting is improved with a combination of strip lights and spotlights. A window has been installed in the corridor between the two coaches which certainly brightens things up. The toilets are better with the flush being accessible. The basins appear to be on the small side and on our inspection the water supply was miserly and you had to wait a long time for the next dose. The drier is underpowered and will keep people in for longer if they want to dry their hands thoroughly. Our Convener commented "Overall, I would say the trains are a definite improvement on what we had before and I would give them a mark of eight out of ten. I would have given them nine out of ten if they had been fitted with controlled-emission toilets." 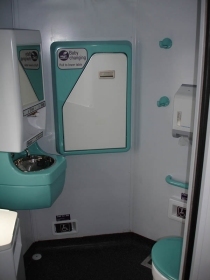 However, it was stated at a recent public meeting in Inverness that Network Rail is prepared to fund 50 per cent of the cost of the project to fit controlled-emission toilets. So, in the not-too-distant future we may be able to raise the score to nine out of ten. FoFNL is pleased that most of the improvements that we have recommended have been acted upon to make a much more comfortable train. FoFNL is concerned that other mechanical faults are causing delays and whilst the door mechanism has been improved other aspects of these ageing trains need to be worked on. We hope that design of a brand new train suitable for rural scenic lines will soon be considered. Meanwhile two refurbished 158 trains will be released into service approximately every month until May 2008.